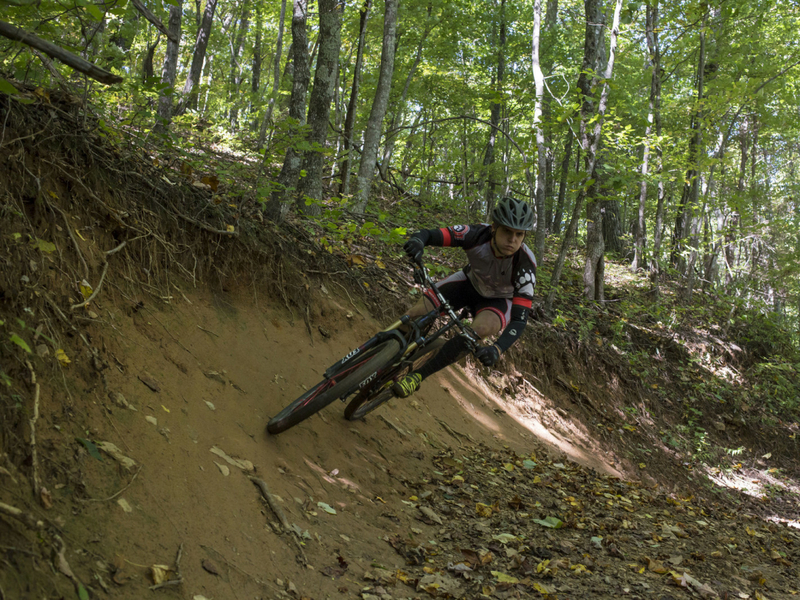 Bent Creek Experimental Forest is, without question, the most popular destination for Asheville mountain biking. It's located a mere 20 minutes from downtown Asheville, and is more beginner-friendly than the nearby Pisgah trails. Varies; there are severe trails to choose from. 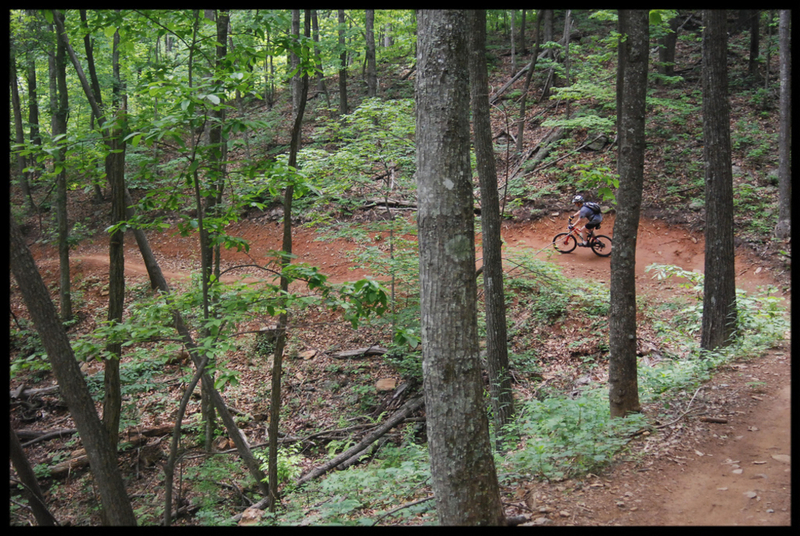 Bent Creek Experimental Forest is, without question, the most popular destination for Asheville mountain biking. With about 30 miles of mountain bike trail (and many more miles of gravel forest road) a mere 20 minutes from downtown Asheville, it’s a great in-town alternative for cyclists not wishing to travel far. 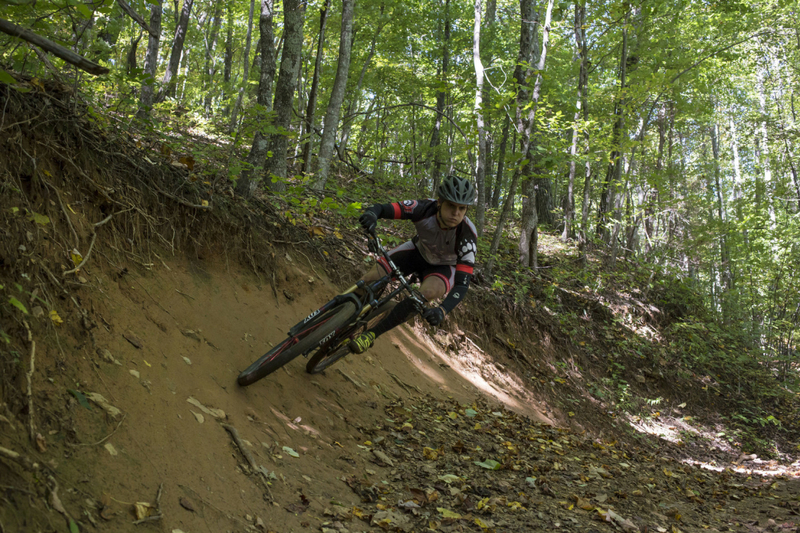 Bent Creek is also relatively beginner-friendly, unlike many of the classic trails in the nearby Pisgah National Forest, with trails to suit a wide range of rider abilities. Nestled between the North Carolina Arboretum and the Pisgah, in the shadow of the Blue Ridge Parkway, the Bent Creek Experimental Forest hosts a fun and convenient network of trails on the southern flank of Asheville. Generally, Green’s Lick is regarded as the best downhill at Bent Creek. We won’t necessarily disagree, as Green’s Lick is definitely a fun descent (especially its wide-open lower half). There is a lot more to Bent Creek than just the Green’s Lick Trail, though, and advanced riders may find others they prefer; try coming down Ingle’s Field Gap and Wolf Branch from the “five points” intersection, for example. The Bent Creek trail map can be slightly intimidating, with its dense snarl of at least 24 named trails intersecting dozens of forest roads. Really, how many offshoots of FSR 479 can there be?? These trails are well-maintained and well-signed, however, and it’s hard to get too lost as long as you have a map. So bring a map! Here are some of the best loops to help maximize your time on the Bent Creek trails. Green’s Lick Loop (intermediate, 11-15 miles, +2000 feet of climbing): Park at Rice Pinnacle trailhead and start at the bottom of Wolf Branch (TR 666). You may also park at either Ledford or Hard Times and take the Deer Lake Lodge connector over to the same spot. Climb the Wolf Branch and Ingles Field Gap (TR 150) trails, then continue up North Boundary Rd -- follow signs that say “To Green’s Lick.” The full climb gains about 1200 feet in about 4.5 miles. Take a left onto Green’s Lick (TR 139) and enjoy the descent. By the way, if you liked Green's Lick, you'll LOVE Kitsuma. Option A: If you’re short on time but want more climbing and another high-speed descent (who wouldn’t? ), hang a left onto Sidehill (TR 145), then climb Little Hickory Top (TR 136) back up to Five Points. From Five Points, you can descend Ingles Field Gap and Wolf branch back down to your car. This downhill is a little steeper and a little trickier than Green’s Lick, and you’ll need to watch out for climbing riders. This ride will finish in the 11-12 mile range, depending on which trailhead you’ve started from, with nearly as much climbing as the longer option. Option B: If you’d prefer something longer and perhaps slightly less grueling, take a right and follow 479G down through the gate, then take a left and climb up Bent Creek Gap Rd (479). From here, it’s a short climb up to the bench on Lower Sidehill (TR 137A), then a sweet downhill back to 479G. Some other guides paradoxically suggest climbing Lower Sidehill to descend the gravel, but trust us: this way is much better, and since the FS 479 gravel has vehicle traffic on it it’s not very fun to descend. If you take gravel back to your car from here, the full ride will be 14-15 miles (depending on parking area). If you want more, you can easily add on the Explorer Loop and Pine Tree Loop trails detailed in the beginner ride below. Intro to Bent Creek (beginner/intermediate, 11 miles, +1400 feet): Starting at the Rice Pinnacle trailhead, climb Wolf Branch (TR 666) and Ingles Field Gap (TR 150), as above, but take Little Hickory Top (TR 136) down from the Five Points Junction. Bear right onto Sidehill (TR 145) and follow it down to Laurel Branch Rd (FS 479G). Ride down the gravel a bit, then take a right onto Lower Sidehill (TR 137A) and a quick left onto the Lower Sidehill Connector trail (145A). Take a right onto Bent Creek Gap Rd (FS 479), then a left and through the gate onto Cold Knob Rd (FS 479H). Take the first left onto the Explorer Loop trail (TR 337), then right at the fork and left onto the Pine Tree Connector (TR 336A). From this point, turn right onto the Pine Tree Loop (TR 336) and climb up to the Deerfield Loop (TR 335). Go left on Small Creek (TR 334), then right on Homestead (TR 333) and follow the gravel roads back to Hard Times, then over to Ledford parking area. At Ledford, pick up Deer Lake Lodge (TR 664) and follow back to Rice Pinnacle. Bent Creek beginner’s ride (beginner, 7 miles, +900 feet): This loop makes a nice figure eight and is suitable for beginning mountain bikers. From the Hard Times parking area, take Homestead (TR 333) over to Small Creek (TR 334) and climb Small Creek to Deerfield Loop (TR 3335). At the end of Deerfield, go left on the Pine Tree loop (TR 336) and follow it to the 336A connector, then take a right onto the lower portion of the Explorer Loop Trail (TR 337). Follow the Explorer Loop trail until it dead-ends at Cold Knob Road (FS 479H), then take a left and climb the gravel. If you’re riding with kids or need to cut your ride short, you can skip this climb and upper parts of the Explorer Loop by going left on Alt Explorer (337A); otherwise, continue up the road until you see 337 and climb to the very top of the Explorer Loop. Follow this back down until you reach 336A again, then take a right onto the connector and a left onto the lower part of the Pine Tree loop. Ride Pine Tree back to Bent Creek Gap Rd (FS 479), then take a left and follow the gravel back to your car. On the whole, Bent Creek will be enjoyed by mountain bikers with an intermediate skill level, with primarily non-technical trails that don’t include much of the rocks and roots you’ll find strewn liberally throughout the Pisgah. It’s a great place for newer riders to build skills and fitness before venturing onto more difficult terrain. Even if you prefer technical riding, though, the proximity of this trail system to Asheville means it’s your best bet for after-work singletrack therapy or, say, lunchtime rides on business trips. This is a multi-use trail system, and none of the trails are directional. It’s also frequented by hikers and trail runners, so please remain aware of your surroundings and be prepared to yield to both climbing riders and other trail users, especially near the Lake Powhatan campround. It’s important to tread lightly here, as the primary focus of Bent Creek is forestry research and study, not recreation; continued recreational trail access is contingent upon our stewardship. Likewise, please do not ride these trails when they are soft from precipitation or freeze-thaw, as Pisgah Area SORBA already has enough trail work to keep its volunteers busy in the Pisgah National Forest itself! The Hard Times trailhead is the most popular and often fills up completely. Luckily, the Rice Pinnacle trailhead and Ledford Branch trailhead are very close by. If you need a water bottle refill, a fountain is available at the Lake Powhatan Recreation Area campground.